Together on February 23, members of YYC Campus Ministry took to the sidewalks of Eau Claire and Kensington as part of the Coldest Night of the Year walk in Calgary. 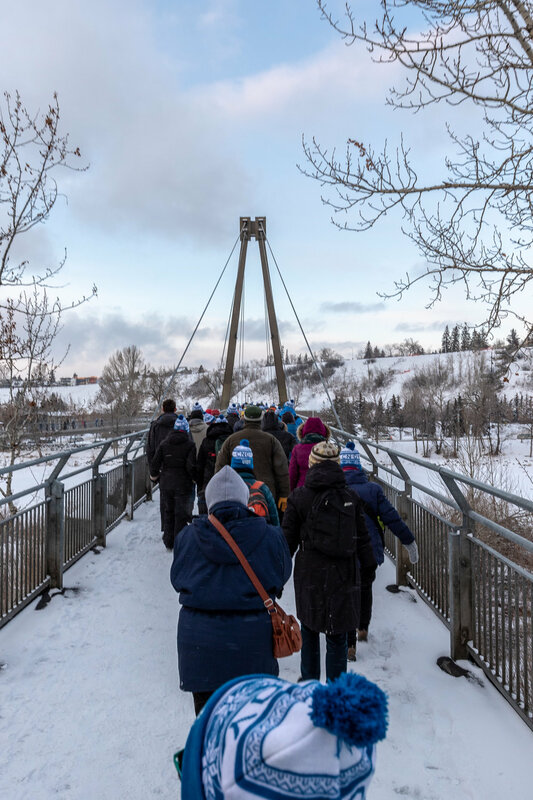 Our team of eight walked side-by-side with 290 other people and 90 volunteers to help raise awareness for the issue of homelessness in Calgary. We left our warm and comfortable homes to walk in the cold to declare our concern for people who have no homes and who need to take shelter in the nooks and crannies of Calgary’s streets. We walked because we wanted to show our support for the organizations who are impacting homelessness and food security in Calgary. We walked because we wanted to be part of a bigger movement. Our small team was one of many on the night to take to the streets in Calgary. There were four locations across our city, and 129 more across Canada walking all at the same time to help raise awareness of this issue and funds for great organizations. Together we raised over $5,000,000 through over 21,000 walkers and 74,000 donors. In the specific walk we participated in there was over $73,000 raised! This was such an amazing night to meet great people and see so many organizations making a massive impact. But beyond that, this walk had a huge impact on the lives and perspectives of our team members. The night was cold, especially once the sunset. It got down to -24, but with the wind chill, it felt much colder. We were shivering and moving faster towards our end goal. Five kilometres isn’t a long way to walk, but as the temperature drops around you, your face starts to freeze and your hands start to go numb, you start counting the steps until the finish line. But we had a finish line. Somewhere that was warm and welcoming, and ready to receive us with food, hot drinks and places to sit. The people this night was in support of, they don’t have that. They don’t always have a place that is warm or welcoming. They may not be able to eat or get a warm drink. And this thought had an impact on our team. As cold as we were, we realized how lucky we are. We could go inside, eat, talk, and then get into our vehicles and go to our warm houses. We didn’t have to worry about where our next meal was coming from or where we were going to sleep tonight. That realization made the importance of this walk go beyond the money raised for our team. It made the issue of homelessness become real for many of them. Our conversations that night and the next centred on if housing should be a right. What would a ‘Housing First’ initiative look like in Calgary? What solutions are out there? What does homelessness look like in the rest of the world? Our students were heavily impacted by the walk and by our visit the next day to the Calgary Mustard Seed. We aren’t sure where these conversations are going to lead our students, what impact they may have in their lives. But for now, we are talking and seeing what we can do as a Ministry to help support many of these issues. With Bell Let’s Talk Day occurring recently, this seems like a good time for a conversation about little things you can do in your everyday life to improve your own mental health. Mental health is one of those things that is talked about often today (although still not as often as it should be), but you may be confused about what you can do to improve your own short of going to therapy. And it can be difficult to begin to think about. That’s where this little list comes into play. None of these tips are intended to deal with large mental health problems, nor are they meant as replacements or alternatives to therapy and proper treatment. These tips are meant as little reminders, boosts, add-ons, or extra pieces that can complement other mental health strategies that you are employing. This goes beyond suggestions of ‘exercise more’ (although exercising is an amazing thing to do to help improve your mental health). It’s about taking care of your body as a whole, both with movement and with food. And that can be incredibly difficult as a student. Between time crunches and food budgets, eating right and getting moving can fall off the back-burner and get lost behind the entire stove. That being said, there are some little things that you can do that won’t make a huge dent in your food budget (and may actually save you some money). Eat often and don’t skip out on meals. Food powers our body, and not eating when your body tells you it needs to is going to lead to being irritable for the day and not thinking as clearly. This opens you up to more negative thinking and negative perceptions of things around you. Watch the caffeine intake. Students seemingly live off caffeine, drinking multiple cups of coffee and black tea every day. And while it may provide a temporary boost to energy, relying on it and consuming large quantities of it every day can lead to downswings in energy and even contribute to feelings of anxiety. Plus, if you aren’t making it at home, that gets expensive very fast (there’s a reason that Starbucks made $22 billion in sales in 2018). Just like caffeine, sugar can provide temporary energy boosts, but they last just a short while before you start craving more. Sugar has been shown to be highly addictive and can lead to mood swings and irritability. Watch for feelings of craving sugary food products and if they correlate with low-feeling moods. Alcohol in small doses can be fine (and in some cases improves) your health. But alcohol dependency or even drinking often can exacerbate feelings of anxiety, sadness, and depression. If you find yourself craving alcohol or drinking daily, it may be time to reach out and talk to someone. It helps us cope with stress. It helps us feel good about ourselves. It helps us sleep well. Getting moving also doesn’t have to be torture! Too often we equate moving with doing something painful. Pick something you enjoy doing that gets you active. And if you don’t know what you enjoy doing, this is your chance to explore all the amazing ways we humans can move! If you pick an activity you enjoy, you are far more likely to keep doing it! Plus, it will help enhance the positive feelings that exercise can give you. Getting moving with a friend. Not only will you experience the benefits of moving but you will also get to connect with another person. This is very positive for your mental health as well. The next time you are feeling overwhelmed by tests, anxious, or just down, try getting outside and going for a walk. I know that’s harder in Calgary somedays, but the simple act of walking, the fresh air on your face and the sunshine can alleviate feelings. Sleep has a huge effect on mental health. When we get enough sleep, it is easier to cope with stress, handle problems, concentrate, think positively and remember things. One of the biggest mistakes we see students making is thinking that they can get more done by cutting back on sleep. This is a big mistake, as doing this often will severely affect your ability to process information, deal with situations as they arise, and identify when you are struggling. Focus on slow, relaxing activities before bed. Things like yoga are great if you want to move a little bit. Reading, sketching, and meditating can all also help your brain to relax and calm down before going to sleep. Avoid big meals, alcohol, cigarettes and caffeine before bed. Make sure your room is comfortable for you to sleep in. This varies greatly for many people, so if you aren’t sleeping well try experimenting with different pillows, room temperatures, and even sounds. Follow a routine. Doing the same things before bed can help signal to your brain and body that it is time to go to sleep. Also, go to bed at the same time and get up at the same time (as much as possible), even on weekends. Student life is busy and that can make it hard to remember to take a second to breathe. But it is incredibly important to slow down every once in a while and maybe even stop for a moment. Doing this can give you perspective on everything that you are doing and where you are at. It can give you the opportunity to appreciate how far you have come and what you have accomplished. It can also give your brain and body the chance to reenergize and refocus. Going alongside taking a breath for a moment, is taking some time to be thankful. Too often, we think about the terrible things around us, dwell on how busy we are and how many bad things have happened but don’t take the time to really stop and look at all that we have to be thankful for. This can be as simple as having a roof over your head or even the opportunity to go to post-secondary (as there are lots of people who never get that chance). This is important because looking at all you have to be thankful for can help improve your mental state and help you to see past negative roadblocks. Often, this will help you refocus on the positives. Finding a community of people whom you like and trust can be difficult, but immensely rewarding. Humans were built to live in community, but too often much of our work and life are lived in places without much human interaction (digital or otherwise). This is why it can be so important to connect with others, people who understand who you are and people whom you can walk to when need be. Let's talk goals vs experiences. Backpacking off Spray Lakes Road in the Rockies. I'll be honest, goals have never been a driving factor in my life. I've never found them to be encouraging or enlightening or motivating. If I don't finish my goal it doesn't bother me. I understand this is unlike everybody else, but truthfully goals have never driven me. The one enlightening thing they do tell me, however, is the experiences that I want to have and the experiences I want to aim at. I see goals as the end product of a lot of work. I don't see them as the point of doing a lot of work. Goals don’t drive me because they have no emotional impact. If I set a goal of climbing that mountain and I achieve that goal, to me that means that I have climbed the mountain, stood at the top, looked all around, see the beautiful view, and climbed back down. And when I'm down at the base, then I can stop and say to myself, ‘I've done it I have achieved that goal.’ But what about the experience of having climbed the mountain? Was I so focused on the goal that I forgot to appreciate the experience? Goals are about aiming at the end; experiences are aimed at the feeling of doing something. They are the emotional reason to act. Think about it this way. You set a goal to make $1,000,000. So you put your head down, you go to work 80 hours a week, you invest well, you save money, and eventually, you have made a million dollars. But how does that million dollars change you? How does accomplishing that goal affect your life? How are you different? While you were making that money have you forgotten to go outside and experience other things that you wanted to do? Were you so focused on achieving that goal - on achieving your million dollars - that you have forgotten what life is really about? What experiences did you sacrifice to get there? And how does your soul feel today? I had the fantastic experience of sitting in St. Mark’s Square in Venice at midnight shooting awesome photographs. It's taken me 29 years to figure out the difference between goals and experiences. Goals are based in logic, based on an ending. Experiences are based on emotion, are based on a journey, they are based on how you want to feel. I don't just want to finish a goal, I want to have the experience along the way. I know to some it sounds like splitting hairs, but to me, they are entirely different mindsets. An entirely different way of going about accomplishing something. I don’t want to look at a goal and not remember the experience of it because I was so focused on the finish. I want to climb mountains, I want to see K2, I want to scuba dive in what's left of the Great Barrier Reef, I want to hike the Inca Trail, I want to travel across my great and vast country, I want to live in Paris and Rome and London, and I want to see so many of the world's great cities, oceans, forests, mountain ranges, and deserts and people. I want to experience all of this. This is not a checklist of my goals that I want to accomplish. This is not something for me to wave in somebody else's face saying, ‘look at what I've done.’ These are experiences that speak to me. These are things that I want to do for myself, to try and fulfill me and to live a life full of wonder, excitement and adventure. 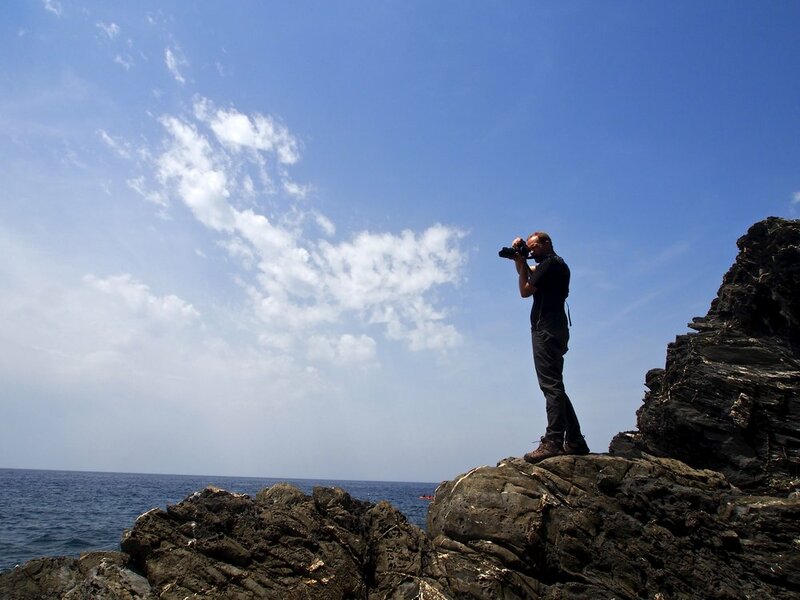 Shooting on the ocean in Cinque Terre. Setting goals is a great place to start, but understanding the emotional context behind that goal is what will truly tell you about yourself. It is also what will help you to achieve those goals. Because it is not finishing that goal that is driving you, it is the expected emotional response behind that goal that is actually driving you. This is about more than just life is a journey and you have to experience it. Because to me, it goes beyond that. Saying life is a journey is such a generalized idea that there is almost no emotional connection to it. It’s just a thing people say. It is too broad a statement for one person to easily connect to. But understanding what experiences you want to have will provide an emotional connection to your journey through life. This is about the journey. But it is about your journey. It’s about what you want to experience. What you want to experience will drive you through all the difficult and drudgery, through the painful and boring, because you have an emotional connection to something beyond that moment. You understand why you need to run that 5km, it’s so you can see K2 up close. If I want to climb a mountain, I don't just want to get to the top and back down again. I want to see the trees along the way, I want to feel the wind rush against my face, and I want to smell the freshness of the forest around me. Life is about experiences, not about a collection of goals. It's not about a collection of things you have done and achievements to show to other people. I believe life isn't about showing off to other people. Life is best lived for yourself. Welcome back to a new semester! We are so stoked for a new semester of drumming, of suppers, of services, conversations, dancing, talking, thinking, debating, and listening. Last week we kicked off all of our programming, and they went off with a bang! On Sunday, we had our Contemplative Worship Service where 10 of us gathered to welcome in the new school year. Then on Wednesday, we kicked off three of our programs at the University of Calgary. Fourteen amazing women gathered together for the bi-weekly Women’s Circle before 22 of us gathered for our Welcome Back Drum Circle. This was one of the most musical and magical starts to the year we have ever had. So many new drummers with amazing skills who just started vibing together right off the hop. 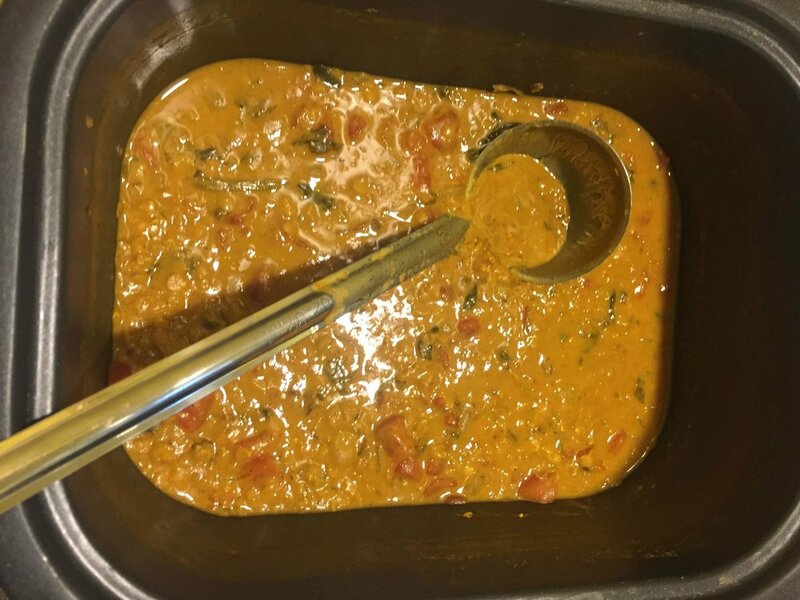 That night we hosted another 20 people at the brand new Faith & Spirituality Centre where we all enjoyed a Glowing Red Lentil soup handcrafted by the amazing Margaret. Thursday saw us kick things off in a brand new location at MRU, the Yellow Room (Z203) on the second floor of Wyckham House. Fifteen of us drummed out some pretty awesome beats, then 8 of us stayed for soup and a great conversation. But the start of the year isn’t just about programs. It’s also about what the start of the semester means. This is a time of transitions for so many young adults, regardless of if they are students or not. September is a time of change and a time of things ending and things beginning. For us at the Campus Ministry, this is a really important thing that we constantly keep in mind when interacting and working alongside the students. For students there a lot of new things to experience, new classes, new classmates, new living situations, and lots of new lessons in and out of class. We are proud to be one of the places that students can come and learn new things, meet new people, and have new experiences. But we are also proud of being one of the places that students can come to when they are feeling overwhelmed. When they need someone to listen to them. When they need to just sit in silence, with someone ready to help bear their problems with them. This is what the Campus Ministry is really about at its core. It isn’t just about providing free food and a musical experience. Don't’ get us wrong, those are amazing and fun opportunities, but what we are at the core is a place where students can come and know that they have people who are ready to care for them. Ready to listen to them. Ready to help them how we can. We are about providing a space for students to be themselves, without the outside pressures of university, of being graded, or of being worried about being judged. Our programming is designed to give students a space to speak freely, express themselves without worry, to make mistakes and to find joy. School is incredibly important ( we wouldn’t be working on campus if we didn’t believe that) but having a space to be free, full of people ready to listen and talk about whatever is weighing on one’s mind is important too. This is why we do what we do, to give students this space. The programming side of these spaces returns on Wednesday at the University of Calgary at 4:30 in the Vitruvian Space for drumming and 6:00 pm. in the FSC (MB122) for the Simple Supper. Then on Thursday, our programming returns at 4:30 for drumming and 6:00 p.m. for the Simple Supper in z203 on the second floor of Wyckham House. Our off-campus programming returns on the second Sunday of October with the Contemplative Worship Service at 6:00 p.m. at Trinity Lutheran Church and then Dirty Theology returns on October 21 at Knox United Church. Drums. Dancing. Screaming. Cheering. Chanting. This is how we celebrated our first ever Pride Parade as an organization. With handmade signs, handprints of love, and the energy to drum and dance continuously for over 3 km. And it was a BLAST! The energy, the excitement, the vigour, the feeling. It was amazing to walk between the nearly 80,000 people who came down to celebrate and invigorate the Pride Parade. But the biggest thing from this afternoon was the love. You could feel it. There was a palpable wall of love that you passed through as the people in the crowd swelled and cheered when you entered the parade route. It washed over you. Enveloped you. You couldn't help but smile. This feeling nearly brought some of our members to tears, it was that powerful. It felt less like getting hit with a wave and more like being wrapped in a warm, inviting blanket. It was pure, unbridled happiness and love pouring out from tens of thousands of strangers. We didn't know them. They didn't know us. But they cheered and we cheered right back. We drummed and they clapped in time. We danced and they got their feet moving. We loved each other as a community, and that is all you can ask for. We had a strong contingent of people, nearly 20 of us walking behind a homemade banner held up by a curtain rod taken from an employee's house. The young adults alongside us let their Pride flow strong. They cheered and got the crowd moving. They drummed and they sang. And they held signs high, proclaiming the true message of the Bible and of Jesus. Love. This was important. Especially when protesters appear, proclaiming god isn't proud, that we were all sinners, that everyone should repent. It was even more important when these signs appeared. But there were few of them, tucked in one corner of the route. And it was powerful for us to counter their protest with our signs of love, of grace, of joy and happiness. To counter their protest with our very presence. We were part of a large and long contingent of churches and religious organizations there to stand with the LGBTQ+ and two-spirit communities. We were over 500 strong marching in the parade alone, let alone all the believers in churches and on the sides of the parade this morning. They were a tiny number, hiding behind large signs. We were loud, large and proud of supporting these communities. We let our presence be known. We let our message of love fly in the face of their hatred, and the 80,000 people around us cheered with us. 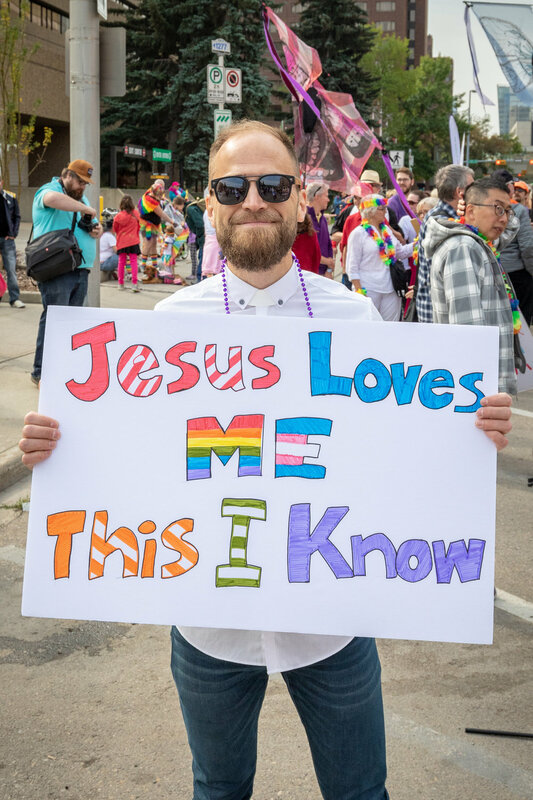 They roared when Tim ran in front of their signs, dressed full on in his robes, rainbow stole and collar; grinning as he happily supported the Pride Parade. It is those visible signs of hatred that make the Pride Parade, Pride week celebrations, the work of Affirm United, and GSA's so important. People often ask why we need the Pride Parade and the celebrations. Those signs tell us why. They also tell us why it is so important that the Campus Ministry is pursuing it's affirming designation. We started that process earlier this summer, putting our work where our words have been for so many years. Today was something special for us all. We walked together. Visibly, happily, and in unity as an organization with a squadron of young adults walking, dancing, and drumming along with us. We took an important step as an organization today, openly acting upon what we have been saying for years. Now it's time for us to keep the excitement going. Pride is more than just one week, it's every day of every year. It's about showing support and inclusion at every event and every corner of our work. It's about showing love for everyone. Our team with Mayor Nenshi at the end of the parade route. Lately, I have been thinking a lot about what it means to me to be a good ally to my friends in the LGBTQ+ and two-spirited communities. More and more that has meant coming out more fully and being more visible in my church, work, and life in general as an ally. I had one of the most beautiful, enriching and affirming conversations of my life recently with a good friend in the LGBTQ+ community. It both reminded me of the importance of this work and affirmed how difficult it is, even just as an ally and not LGBTQ+ myself. I have struggled with the idea of becoming more visibly an advocate for the LGBTQ+ community, as I have very good friends in all facets of my life who think very differently about this topic than I do. It pains me to think that I might alienate them or offend them, or that it might alter our relationship or their respect for me. However, it pains me even worse to feel that I am not doing my utmost to support and advocate for dear friends of mine in the LGBTQ+ and two-spirited communities. These are individuals who I respect and admire greatly. Many have stories of pain and trauma from the intersection of their sexual or gender identity and their faith identity, especially Christianity. Churches are often dangerous spaces where LGBTQ+ individuals can be judged, condemned, and even attacked. A person in the LGBTQ+ community recently told me that the Bible had been used almost exclusively for them as a weapon. I found that heartbreaking, in a religion that for me has always been oriented around love and inclusion, particularly of the marginalized. This is not to say that all churches are unsafe, some churches will be the first place a member of the LGBTQ+ and two-spirited communities will come out of the closet as they know they will be loved and supported. Some are merely neutral, not putting forward an opinion on the matter either way. However because of the overwhelming Christian narrative of judgement that people in the LGBTQ+ communities hear and experience, a “neutral” space generally still does not feel safe. It could be that people are still heterosexist, they’re just not talking about it. I would dearly love to share my wonderful denomination and faith with LGBTQ+ friends who are searching for a church home, and I would love for it to be a safe, inclusive (at all levels) and nurturing space for them, so that is one of the main things I am working toward as an ally. My earliest memory of standing up as an ally was at a city-wide meeting several years back. It was scary but ultimately a positive experience. The topic of Human Sexuality has been debated heavily in my denomination for the last several years and even decades. This meeting was partly about discussing sending an overture my church’s national gathering on this topic of Human Sexuality several years back. I was quite young at the time, and one of the few in the room who was neither clergy nor an elder, and as a female was definitely in the minority. There was not much conversation, and what was said did not seem (to me) to take into account the fact that these doctrines we were discussion directly affect human lives every day. I spoke up to add some personal stories from my experience interacting with folks who are gender and sexual minorities, and although it was nerve-wracking as I was the youngest in the room by about 30 years, the dialogue remained respectful and I felt heard. I was approached afterward by an individual who said that my words had touched them deeply, so I was glad I had spoken. Not long after, a congregation hosted a conversation series on Human Sexuality. I went to all of the sessions, but was disappointed again in the cerebral-level of the conversations, and lack of acknowledgment that we were discussing human beings. There was no talk about people or their stories, and no representation from the community we were discussing (as far as I knew). We merely reviewed the Report on Human Sexuality document from over 30 years ago, discussed theology, doctrine and biblical interpretation as if this topic didn’t directly affect thousands of lives. I spoke up briefly in support of a more inclusive understanding of how we can love all humans of all sexual and gender identities. I was immediately and aggressively opposed by an elder of the church, who disagreed with me on a biblical basis loudly and vehemently. Disappointingly, nobody commented on their aggressive tone or moderated the conversation. I didn’t speak up again. It didn’t feel like a safe space to discuss differing views. That experience of being opposed so aggressively hit me pretty hard, and I struggled to speak in my denomination or church after that. I do know however that my denomination has been working very hard to create safer spaces to discuss differing perspectives, as well as to humanize the discussion and bring in the stories of those with lived experience of what we are talking about and debating. I was also humbled to know that my experience was nothing compared to what those in the LGBTQ+ communities face sometimes daily, sometimes hourly, condemning their very identity as wrong. Another important realization from that experience is that I also have to watch my language, and be careful not to attack those with differing views than my own. Meeting each other with the grace to allow our faith to be big enough for our differences feels like an important part of the process. Since then I have thrown myself into supporting affirming communities, educating myself, and helping to make my work community as safe as possible for all students and people of all sexual and gender identities. I have had many positive experiences in the past few years as I have learned and grown as an ally. I had the pleasure of walking and drumming in the Pride Parade for several years with an affirming congregation, which was an absolute joy. I got to share my gift of drumming and music and brought some friends along. I have learned from students and staff at Calgary's universities more about how to use pronouns and create safer spaces for those in the LGBTQ+ communities. I have attended workshops at the Q Center at the University of Calgary such as “alphabet soup” which have helped my knowledge grow enormously, and navigate those ever-evolving letters! My admiration for these courageous folks to share with me has grown, as has my desire to do something tangible to support these friends and help to heal the trauma that my religion has caused in so many. It pains me, when occasionally they ask me about my church, that I cannot offer them a space I know they will be loved, valued, supported and included in every part of the church’s life. One of the things I learned in this process is a better understanding of the constant fear many of my friends in the LGBTQ+ community live with on a day to day basis. It is so hard for these friends to be constantly having to advocate for their own identity to be accepted, often uncertain of the reception they will receive. In many cases their very safety is at risk when their sexual or gender identity becomes apparent. I am so humbled to consider the intense courage and strength of character it takes many of these folks just to exist in the world. In order to hopefully relieve even the tiniest bit of pressure from the LGBTQ+ community constantly having to advocate for itself, I want to become much more visible as an ally. The more of us wearing rainbows, the less targeted folks in the community might be. The more of us advocating for our friends in the community, the less they are forced to advocate for themselves. It is enormously easier for me to advocate for an identity that is not my own, as I don’t have trauma associated with it. Not only that, but sometimes folks are more willing to listen to people who are not within the community they are advocating for. That should not be the case but unfortunately all too often is true. The time has come for me to speak up once again, talking clearly about what I believe and why, while still acknowledging all perspectives as valid and worthy of being heard. To this end I am making my social media more “rainbowy”, in spite of having friends from many different perspectives on there who might disagree or become alienated. I am committing myself to speak out against homophobia when I come across it, to consistently advocate for LGBTQ+ friends, and to continue to learn, grow, and gain understanding. I am humbled by how much I have yet to learn on this journey, but it is so worth undertaking. It has been such a relief to now be working more tangibly for healing and advocacy for these friends. I love being able to do something to support them, and hopefully, create safer spaces where they can fully be themselves. It brings me great joy that our campus ministry is embarking on becoming an Affirming Ministry, that we are walking in the Pride Parade, and that we can show tangibly that we advocate for the love and inclusion of all people in all aspects of life and the church. Several individuals within the community have warned me that being out as an ally can be extremely hard and draining, so to be sure to build in a network and self-care. It was humbling to hear this from folks who have no choice but to be an advocate, just by their existence, and if it is that hard for me how much harder for them. I was deeply touched by their care of me, despite the fact that it will always be a thousand times harder for them. I do want to heed their advice, if only to ensure I have the support to stay healthy and continue the work of advocacy. If you are the praying type, I ask for prayer support as I embark on this journey. I have witnessed the power of prayer and believe strongly in its significance. If you would like, feel free to check in and see how the process is going, and how I am doing. Similarly, take some time to send encouraging words of support for all allies and all those living as a sexual or gender minority, who don’t have the choice of tuning out of the work for a while to take a break. There is more I could say but I don’t want to run on too long (thanks for reading this far). Please feel free to chat with me if you’d like to chat or share experiences of being an ally or other things on this topic, I would be happy to share more. I am, however, not interested in debating theology. Now I am looking forward to passing on that care and support to my LGBTQ+ friends. I will work on listening to all perspectives, attacking no one and extending the grace Jesus taught us as Christians to all people. I am looking forward to getting my rainbows on and walking in support and solidarity with my LGBTQ+ friends and siblings in the Pride Parade, and continuing to learn and grow as an ally. What a privilege. It takes courage to step up onto a stage and perform. It takes determination to perform solo. It takes bravery to perform something heartfelt, honest, and raw, something that tells your real story. 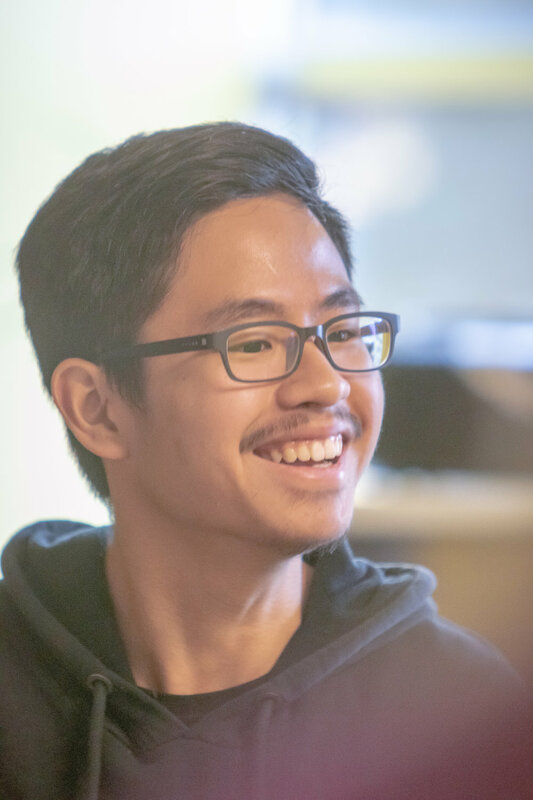 This is what Shubhechhya Bhattarai did during the Coming Out in Faith monologues hosted at Hillhurst United Church in April. They stepped up and performed a powerful spoken-word monologue centred on the intersections of their faith and being transgender. Shubhechhya was in a unique position at the monologues, presenting as a transgender person of another faith in a Christian church. “They wanted something different and I mean this (was) very different from any of your traditional narratives or just the content you always get at coming out in faith,” Shubhechhya said. “We’ve never had someone of a Hindu like tradition come forth like this. Scary thing, but well worth it. ... The person who actually did the coming out in faith monologues shared the video and she was like yeah keep telling everyone about you it’s just that amazing. And that said something for content that’s very very different. "Even the notes I got after the fact, they leave you little performance notes, going through all those notes. People are like 'this is amazing to see these similarities between Hinduism and Christianity,' and the concepts of energies, or just someone being like 'yeah you’re right this is not something that is talked about in Hinduism but it’s so important none the less.' It was so inspiring for people, who even come up to me like 'this was an amazing piece' in tears." The 7 1/2-minute piece is witty, quick worded poetry that gently massages together humour, heartfelt, and insightful moments that got the crowd in Hillhurst United Church laughing, crying, and thinking all at once. Shubhechhya, a student at the University of Calgary, didn't have the chance to audition for the monologues but the producers loved their work so much that they were accepted based purely on the writing. I am including the link to the video in the blog, please take some time to watch it (and watch it a few times). It is well worth the almost 8-minutes you will spend watching it. Here, I am going to add the Q&A that we went through with Shubhechhya in the YYCCM office last week, rather than continuing to put my words around Shubhechhya's thoughts. In my belief, this is the best way to get the true sense of Shubhechhya's piece, their thought process behind it, and their true voice. Joining us in the conversation was the Campus Ministry Communication's Assistant Eden Middleton, another student at the University of Calgary and a friend of Shubhechhya's. Robert: When you found out they responded to you, you didn’t audition but they loved it. What’d that feel [like]? Shubhechhya: I don’t know. I don’t think I thought much about it. I was like “Cool I’m in. Oh, awesome I get to do another putting myself out there piece.” And then later reality sorta set in as the weeks progressed and we get into rehearsals and stuff like that. ... The day of I was full on, “Okay, this is happening.” I’m actually pretty nervous in the video before I start talking. You can tell, I actually start out the video with a deep breath. ... What people don’t know, because they couldn’t see, was backstage I was restless. For the most part, I just laid in the back on the floor. One, because Hillhurst floors are very creaky so you can't really move much, and if you move everyone in the audience can hear. So I couldn’t do anything! ... This is the most comfortable position at the moment. Wooden floors are actually really, really comfy. Surprisingly. Robert: Especially when they’ve had so many feet go over them over the years. Shubhechhya: I wouldn't say it’s soft though, I wouldn't say it’s soft, I was just so comfortable, I was like I’m just going to be right here. And then, when I need to, I will get up and go forth. Robert: That’s the perfect transition for something I wanted to ask you. So you open that door, you go out. Talk me through that moment. Shubhechhya: After, who was it? I think it was Pam [Rocker] who was doing the introduction for me. I’m listening to this introduction being like, ‘This is happening, this is happening’. It almost felt surreal. I am being very, very vulnerable now. Because the reality of having done the interview with Global [News] really hit me as well. Like, what is this impact? What does it mean? And I knew I had friends out in the audience, so I was like, 'Oh wow, this friend is going to see this whole different side of me that they haven't experienced before. What is this going to be like? How am I going to connect with them? And how will they see me now?' And it was...it was sort of an almost nerve-racking moment. Then, 'no, stop. I can’t think right now.' Focus. Yes, I know my piece, I KNOW I know my piece. I’ve been going through this over and over again, I know I have it down. And then just go through it. Because when I first heard it, it just threw me off guard. This is exactly it. Everything I keep hearing that it’s not supposed to be. Even though I overthink it a lot as well, like oh no it can’t be this way, things have to be this or that but to hear a line that's, 'It’s totally fine. All that is unnatural is also natural all that is, even if it isn’t it is.' ... Sanskrit has that as well I think it’s like "therefore art thou." You just are. So read that and be like, 'Okay this is something else that people just pick and choose what they feel comfortable with.' But nowhere I have found that says that being queer is wrong. Quite the opposite. There are so many stories about it. But people are still like “no we don’t wanna--” but it’s there! Literally, it’s there! It doesn’t say it’s wrong, it’s just misunderstood. At least it feels like it’s misunderstood. Robert: Another line I wanted to ask you about, "The boxes of masculine and feminine cannot contain all of me. Neither one can hold all of me." Shubhechhya: We’re laughing because that’s the line I messed up on actually. Shubhechhya: It’s supposed to be the boxes of male and female cannot contain all of me, neither one can hold all of me. Nerves. But I don’t want to create that box for myself. I want to fit into a box that’s already there and expand from there rather than, “Here’s my bubble that I live in.” 'Cause if you just live in a bubble where does that go? You don’t go very far. It’s about breaking past that bubble. For me, it’s like I want to break my bubble, but also I want to hold on to what I know and what makes sense to me. ... This is something I thought I could do but I couldn’t. But this other thing is not something I can do at the same time. Because it just feels weird. Expectations. What are the expectations that come of me from someone who doesn’t look like your typical binary? Like the expectation of what is it supposed to be. Well, I’ve been read very masculine by a lot of people, but sometimes people will still like point me out, “Oh, no, that’s female." There’s just something about it. But, the amount of confusion you get is kind of interesting. Hence that middle ground. No one can pinpoint what I am, where I’m supposed to be. Robert: Those were the two lines I really wanted to ask you about. Because I really, really loved those two lines in particular. I want you to talk about the end of it now. So you finished it off with “I exist." And then you kind of sigh and bow your head. It’s almost this perfect ending note of relief and also like saying you are there. Can you just reflect on what it was like to finish and what went through your mind? Shubhechhya: Yeah, I guess I have to say there was that sigh of relief, that sense of relief, of 'Oh my god, this is done.' And it’s sort of like a softness like you don’t say “I'm here!” Right, it feels forceful. I didn’t know how it was going to end, there were so many possibilities of what this ending could be. ... It ended up being let’s gauge how I feel. Whatever happens at the end happens, as long as it’s just as powerful as I want it to be. And it was. Kind of like, a realization moment. Yeah. I’m here. Oh my gosh, I’m here. “Oh okay. I’ve just done this.” And that’s one of the hardest things you can ever do, especially when you’re scared of just putting yourself out there and how you’re going to be seen by other people. And think, what is the impact? What am I going to walk away with? For me, part of this piece is which person will it reach? Will I be able to actually help someone else? It's also the reason why I’m sort of interested in storytelling even though I’m not fully involved in it still. A narrative I can relate to. There are many narratives out there, but not many that I can relate to as being a third culture kid, as being someone of colour, a person of colour and a person of faith. Or there’s not enough representation for transmasculine people. Where is that? So it’s sort of to put myself out there, “Here’s my experience. Take it as you will, or take it with a grain of salt, or take it at face value, however, you want to take it." But I hope maybe that this can reach someone who’s probably also struggling to find a story that they can relate to, and what that means to this person. Because that can be hard. That can be really hard, finding stories that you can relate to growing up. ... At the end of the day, even if there’s nothing else, I have a really awesome piece that came out of this. Even if it affected no one. I just worked so hard on this, and I love it. Honestly, I have this awesome piece that came out of it if nothing else comes out of this. Eden: I’m curious. You talk a lot about it being hard and scary to stand up there and be vulnerable, which like, I hear you, and I’m wondering where did you find the courage to decide to do this despite that fear and that hardness? Shubhechhya:...tough question. So, despite feeling vulnerable and being like ‘oh my god this is so hard’ to fight through and be like, 'No, I’m doing it.' Um. Do what scares you the most? That’s the best I got. Shubhechhya : You just gotta do what scares you the most. Part of me just felt like this was important and that this was something I should do. I didn’t have to. There was no obligation for me to continue through. But I just felt like at the end of the day, I want to really break through me being, 'I’m an introvert, I don’t want to do this, I don’t like public speaking' all that stuff, anxiety, all that. No. I felt like this was something, a story I felt like I couldn't just keep for myself. It was a story I felt needed to be shared. Robert: I want to ask you a couple of questions about how you were saying at the beginning [of the piece] you learned about this in a class, a religious studies class. Robert: Yeah. Dig into that a little more, because it’s like a ten-second chunk [in the piece]. Shubhechhya: Oh man. Yeah it was quite something. Being like, “WHAT DO I DO WITH THIS INFORMATION?” I was literally like I don’t know what to do with this information. Which I really still don’t, honestly, I still don’t. Gods and Goddesses are not fully in their binaries, it’s more like, all energies. That’s all anything is, it’s just energies. There are some people who might be male-identified who might have more feminine energy than someone who’s female-identified who has masculine energy. It’s just a thing. It’s just a balance of energies. Some might have equal balance, some might have more balance, overpowered more. That’s all it is. It’s just kind of interesting. Robert: Cool. Thank you. I’m going to try and wrap it up here because we’ve been chatting for almost 45 minutes. Eden had a few really important questions, so we are going to cover them. So, the first one, what advice would you give to someone who’s doing the Coming Out in Faith Monologues? Shubhechhya: Advice for people doing COIFM…I want to say, trust the process and what’s going on. Because sometimes you’ll come up with something like, ‘Oh no this doesn’t make sense’ or ‘this line just does not work.' Experiment with it. Figure out what it is. Taking time to, as much as you get sick of it, go over your story over and over again, taking time to break it apart. Ask what does this mean? The patience that the facilitators have, they took the time to work with me through my pieces and give me the feedback that I needed to make sure I’m hitting on the points that I need to. ... So hands down, don’t be afraid to talk to your peers and your director. That’s the main advice. Also just trusting your gut and your process like will it work, will it not, and it if doesn’t work that’s fine because at least you gave it a shot in terms of the content you’re putting out there. Robert: Thank you very much for that. Question number two. What advice would you give to someone exploring their own gender identity? Robert: You don’t have to answer either by the way. Shubhechhya: I know. But you know, honestly, for me, I just very awkwardly would talk to people. Talk to people. You might discover something. It might prompt something for you. Sort of trying to be open rather than already having yourself in a box might help. And just be able to have that acceptance about whatever’s going to happen. Because yeah, it takes time. So as awkward as it is, no matter who you are, talk to people. Even if it’s not specifically about gender and sexuality. Just engaging in a conversation about something might help prompt something. Because really that’s what I did. ... Seeking out your mentors. You don’t have to just have one mentor, you can have a mentor for many different aspects of your life. So many different friends can be mentors, you can have an actual mentor, you can go through different things. I think that’s something very valuable to me, is finding people who can be like mentors to me. And just getting information there. It’s exploration. As scary as it is, it’s very rewarding, especially when you’re surrounded by people who understand and empathize, who have empathy for what you’re going through because they’ve gone through the same things. Maybe not in the same capacity, but they get it. And that was very powerful when you feel heard. It’s the most powerful thing ever. Robert: Thank you. Last one. 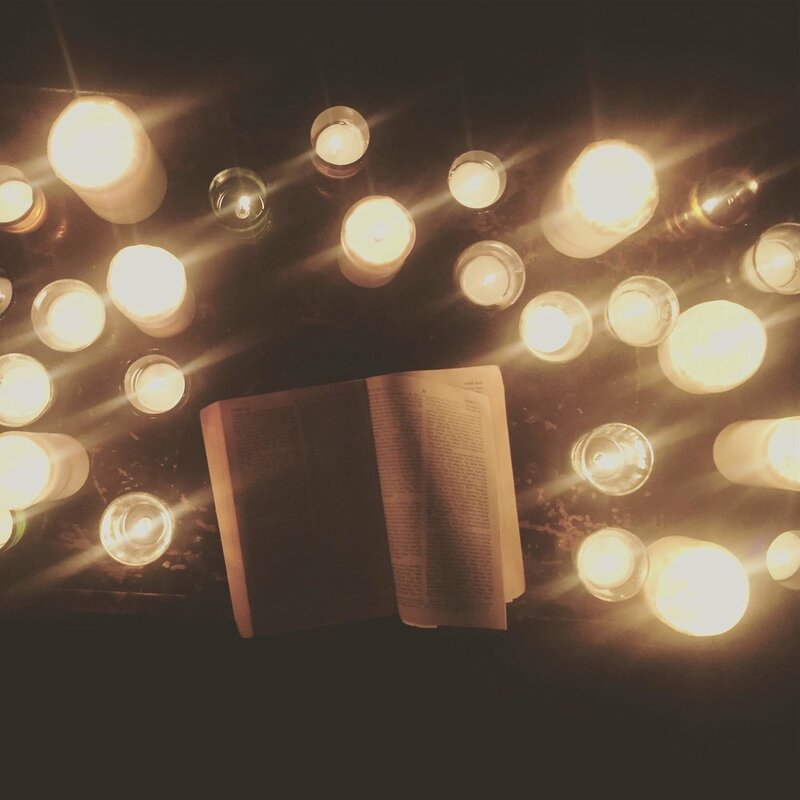 What support do you wish communities of faith would offer queer people? Shubhechhya: ...oh my gosh. That’s something I’ve definitely grappled with. To have that openness and to understand that if someone was really grappling with identity. Sometimes, your identity and your self, they’re not two separate things, sometimes they’re ingrained into the same thing. And just being like, don’t tell me it’s wrong. Tell me how this makes sense, the ways this makes sense. Clearly, as my own exploration has told me, these things can exist. It’s where, how does it make sense that they exist? No, it’s actually not. That doesn’t help. If you tell me that now, it’s not going to help. It hasn’t helped for somebody else because they might be on the verge of, 'I can’t take it anymore.' What do you do with all this information? So yeah. Just openness. I love the word “queer”. One of the first times I heard it was when I was a teenager on the football team. “So and so is queer.” It was an insult of course. “Queer” has always meant differing from the norm in some less-than-desirable fashion. It conveyed a sense of distaste and--not so much contempt--but of dismissal, as if the person or thing one is describing as queer is beneath contempt. When it began to be applied to homosexual people it was more than an insult, it was a way of rendering that person invisible. I don’t remember who was the object of that insult. Certainly, it wasn’t my brilliant, aristocratic, uber-athletic best friend Matt, who was also on the team. He couldn’t possibly be queer and no one would think to call him that. And yet, as I realized a couple years later, he was queer. Not an easy thing to be in 1972, or whatever year it was. Matt got out of town as soon as he could and never looked back. We met up sometimes in Toronto when we were both living there. I was always eager to demonstrate to him how non-homophobic I was. He never seemed all that impressed, but then, it was really hard to impress Matt. He had such high standards. Matt died in 2009 with a smile on his face, minutes after crossing the finish line defending his title as world Triathlon champion in his age group. He died of a recently-diagnosed, and unfortunately ignored, heart murmur. He left behind to grieve his partner John. His partner, mind you, of twenty-four years. Nothing queer about that. That’s love. There is something Godly in that reversal. The first shall be last, the last shall be first, the meek will inherit the earth. That’s why I love the word “queer”. When I was a young child, there was a secret place I would go when I was worried or upset. This place has shaped me possibly more than any other experience in my life, even though one could easily argue that it’s not, in fact, real. This place was more or less a room, through a secret trap door at the back of my closet, accessible only to me. When I was having a bad day, I would lie on my bed and take myself to this room. Through the trapdoor, all was white light with vague walls that had shelves. When I was in the room, I always had a sense that I could have anything I wanted, anything at all. My child mind would try to imagine toys that I wanted, or dolls or piggy banks. Try as I might, my attempted imaginings never amounted to much of anything filling the shelves on the walls, to my slight disappointment. This was because, even though I thought those seemed to be fun things to want, I didn’t actually want them at all. I was always permeated with a feeling that though I could have anything, I also already had everything I needed. I was my fullest, most complete self in that room. Filled with unconditional love and light and contentment and thus couldn’t actually imagine anything else that would make me feel happier. I was enough, and because of that, I had enough. That room, and the sense that there I could be a full and complete being with every need met, shaped my sense of self in the world. For me, that room was G-d, and because of it, I have always known quite tangibly that I do not walk alone. Because of it, my G-d is one of love, of fulfilment and peace, and of light. I never ever experienced a sense of judgement or shame or any sense of not being enough in that room. I was lucky. 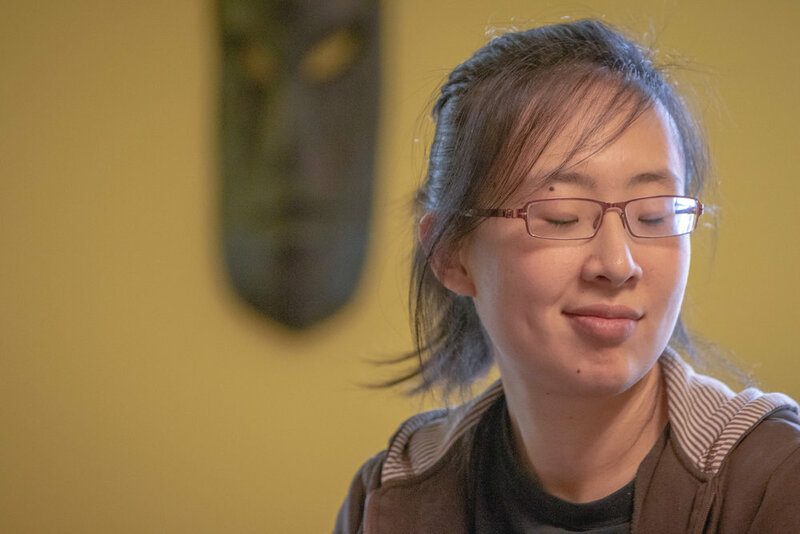 As I grew up I lost that ability to go to that room, but through my church community and most of all through my Mom’s robust faith, I was able to maintain my sense of connection with the divine. My Mom encouraged me to explore this through questions and dialogue, reading, journaling, walking in nature and workshops. Her faith is also centred firmly on experience with an unconditionally loving God, and this helped me to nurture my own. My sense of the divine expanded from that room to permeate my whole life. I see that same unconditionally, radically loving G-d of my trapdoor when I read the beautifully messy, rich and fascinating stories of humans in the bible. I read about it in Queen Vashti and Queen Esther, teaching us about anti-oppression and standing up for the dignity of all humans. I read about it in Jesus consistently challenging the religious leaders and hierarchies of the time that were not centred on love and compassion. I read about Jesus rubbing his spit into the eyes of a blind man, chatting with an outcast Samaritan woman at a well about the 'living water' which will cause you to never thirst. I read about how he created space for an unclean woman who had been bleeding for 12 years to come to him, share her story, and affirming for her that her faith had made her well. What a drastic change for this woman, likely an outcast for the past 12 years, to suddenly have a chance to not only be healed but to speak publicly. To have her story heard and to find not only physical healing but also, just as importantly, social healing. He told her to go in peace, and I imagine she felt loved and “enough” for the first time in a very long time. What does this room have to do with my rainbow bracelet? Those stories reinforce for me this love-centred G-d that I feel so connected to. The G-d I meet in Psalm 23 when it says, "The Lord is my shepherd, I need not want." I rarely share the story of my trapdoor room, in fact, I have probably spoken it out loud, other than to my Mom, only two or three times. It feels quite personal and vulnerable and speaks to my deepest sense of self and my faith. However, when I thought about articulating why I wear my rainbow bracelet, it seemed inextricably linked with that room and the deep sense of a radically loving G-d that that room cultivated within me. Because I have been deeply and fully loved by G-d my whole life and felt filled to overflowing with it. I have enjoyed sharing that love with all those around me. That love helps me to see people first with love and see all people as beloved children of the divine. I think my lifelong struggle of living with Chronic Fatigue Syndrome has also helped me to have empathy and compassion for all people, as I know we all have different struggles and battles that are invisible to most. Back to the rainbow bracelet. I have always viewed every person, including those in the LGBTQ+ and two-spirit communities, as individuals just as worthy of love and being loved as anyone, without restraints or limitations. Just as I would never seek to tell a heterosexual individual how or in what way it is okay for them to love (as long as it is consensual and honouring of all), I do not feel it is my place to place any limits on the love of those in the LGBTQ+ and two-spirit communities. Love is one of the most precious gifts of being human, and as I heard one Rabbi say, "G-d seems to have made us quite intentionally to be relational humans." Let us not dictate to anyone that they should have constraints on their love. I have many dear friends who are in the LGBTQ+ and two-spirit communities and have friends who identify as each one of those identities listed. I love each of them so, so deeply, and hearing some of the trauma many have been through in the name of my religion causes me pain and heartache. I am so sorry for the trauma caused in the name of my religion. I know a person who essentially didn’t speak for several years because of the trauma caused by their Christian family who held them in judgement and contempt for their sexual identity. I was talking about sin with a minister friend and mentor of mine, and she suggested the sin, in that case, is not his sexual identity, but rather with his family who saw fit to judge him so harshly. I have to agree. That is not love. I talked to an incredible human just yesterday who shared that she intentionally lives in a different country than her family. This is because they would come after her with a priest to cast out the demon they would think was living in her if she came out to them. This is why I have always been extremely cognizant of my position as a practicing Christian, church attendee, and someone who works for a church organization. I am cognizant of the trauma caused by my religion and try very hard to always be clear that I am only interested in affirming and supporting people in the LGBTQ+ and two-spirit communities, never judgement. I also feel strongly about presenting a different kind of Christianity. One centred in love first, as Jesus taught us by uplifting the golden rule, love your neighbour as yourself. My Christianity is informed by the G-d I have encountered, and the radically loving Jesus I have read about and met, by a trapdoor, and by the 23rd Psalm. When I saw this rainbow bracelet at the stall of a jeweller friend of mine at an art market at Eau Claire, I knew I wanted to not only buy it but to wear it every day that I could. I wanted to do this so that I would always be wearing a symbol of my support so that hopefully those in the LGBTQ+ and two-spirit communities would know that I was a safe Christian to be around. Since I bought it at that art market I have rarely taken it off, except to repair it when it gets worn out every year or so. And the odd time for example when I coated myself in mud at the Dead Sea. I was chatting with my jeweller friend recently about how much I loved not only the beautiful rainbow colours and fun design, but also the infinity symbol attached to it. My friend made a great point that to her it symbolizes infinite love. I love that and to me, it also represents an infinitely loving G-d, the G-d that I met going through that trapdoor over two decades ago. I wear the bracelet to stand staunchly and overtly with all those in the LGBTQ+ and two-spirit communities, and to stand for an infinite and radically loving G-d, who says you are enough, and that you are beautiful just as you are.